Juncker hailed the bill abolishing the moratorium on round timber exports. 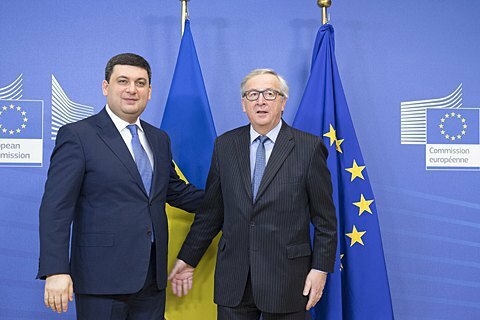 The European Commission is ready to provide Ukraine the second tranche in the coming weeks, EC President Jean-Claude Juncker said on 10 February after a meeting with the Prime Minister of Ukraine Volodymyr Groysman. "Ukrainian government has submitted to the parliament a bill on the moratorium on the export of round timber, and this, in my view, is a sufficient condition for the allocation of 600mn euros, which Ukraine is expected to receive in the coming weeks," he said. "Such a bill has been introduced in the parliament and we are working with the factions and groups to achieve consolidation during the adoption of this law. We are going to find the right solutions that will be in the interests of both Ukraine and the European Union," Volodymyr Groysman said in his turn. The European Commission on behalf of the EU in July 2015 provided Ukraine with a 600mn euro loan. It was the first tranche under the new 1.8bn euro program of macro-financial assistance to Ukraine. The European Commission envisaged the allocation of additional 1.2bn euros in subsequent months assuming the successful implementation of economic and structural reforms, previously agreed between the EU and Ukraine. Ukraine was expected to receive 600mn euros by the end of 2015, and another 600mn at the beginning of 2016. This still has not happened. The last obstacle in the way of the second tranche has been a moratorium on timber exports, adopted by Ukraine. The European Union believes that the ban does not prevent deforestation and timber smuggling but plays in the hands of certain groups of interest in the wood industry providing them exclusive and unlimited access to the nation's forest resources. A joint working group of the government and the parliament has developed a bill that voids the moratorium on the export of timber from Ukraine and strengthens the penalties for illegal felling. The current moratorium on the export of unprocessed timber has become effective on 1 December 2015. The law imposes a 10-year ban on the exports of the unprocessed, or so-called round, timber.